Save over 10% by purchasing the items in the home rust kit compared to ordering them separately. With so many rust problems around the house, garage, basement, and shed, we needed to find a versatile combination of products that could help prevent rust and remove rust that currently exists. This kit focuses on versatile products that can be used in many different applications yet provide a safer alternative ideal for home use. 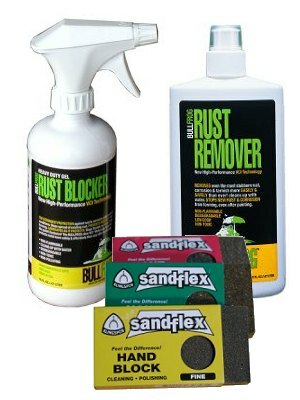 Bull Frog Rust Blocker Gel is an environmentally and user safe rust inhibitor. The Heavy Duty Rust Blocker Gel uses Vapor Corrosion Inhibitor (VCI) technology to form an invisible electrochemical umbrella to seal metal against corrosion causing air and moisture. The VCIs in the gel migrate to seal the adjacent metal. To use, just spray it on the entire surface to form a thin coating. The product will slowly dry to a thin clear film. This clear film will stay flexible so scratches in the surface will heal to continue to protect your metal from corrosion. This thin surface isn’t wax or oil based so it isn’t slippery to the touch and has a slightly tacky feel.